Homeschool gardening is a good way to for your children to learn during the spring and summer months. It is an easy way to teach science. Your child will be able to practice observation and experimentation. Your child will also learn about record keeping and the miracle of life. It is also fun. First you will want to pick up some books from the library. Try finding some books about gardening with children. The books will have activities that are fun to do. To have a successful learning experience there are several things that you need to think about first. Here are several areas. Depending on your family there may be more. Young children can be impatient. Think about plants that are fast to grow. So that preschooler can see some progress. Lettuce and radishes would be good to start with. Outside you can grow flowers, vegetables, some fruits, or herbs. Each will provide its own learning experience. With flowers your child can learn what a perennial is or annual. Your child can also learn about flower arranging. Vegetables and herbs can teach your children about different tastes. You can use containers to grow plants outside or in the house. One type of container garden is the square foot. Make a container out of wood. Divide it into square feet. In each foot a different vegetable is grown. We like this system. It is good for areas that have poor soil. It would also be good for families with small children because you do not walk on the squares. You could also plan to grow plants inside. There are houseplants and herbs that don’t take up much space. Do you want to grow flowers, vegetables, or strawberries? Some plants are easier to grow than others. Know also what plants will grow in your climate. Want to make biology hands-on? Then do homeschool gardening. When you plant seeds your child will learn that some seeds do not grow. In the garden he will observe bugs and insects. He might see plants that die from disease. My children have learned a lot about nature while in the garden. Have your child record observations in a notebook. Record what seeds sprouted. Also draw any bug or insects that you see. See if you can identify the insects from books or the internet. Teach your child about soil. What type of soil is good to grow plants in? Investigate what to add to soil to make it better. Older children can test the PH of the soil. There are inexpensive test kits that you can buy at hardware stores. If you grow flowers have your child research the relationship between bees and flowers. Also have your child find out about what flowers attract hummingbirds. Children with special needs can learn to garden. Because it is hands-on it is great for children who have difficulty with academics. If a child is in a wheelchair a special raised bed can be made. Then the child can wheel under the sides of the garden. If a child is visually impaired grow plants with lots of scents for them to enjoy. Vegetables can save on the family grocery bill. Seeds and plants are inexpensive and can provide food. Flowers provide beauty. They also provide food for hummingbirds and bees. For young children or children who are starting to garden give them a small space. A child can get overwhelmed trying to plant, weed, and harvest a large area. Have your child plant some quick growing plants. Radishes are up in about 4 to 10 days and can be harvested in a month. Leaf lettuce can be harvested in about 45 days. Try and work with your child daily in the garden. Short periods of time are better that one long session. 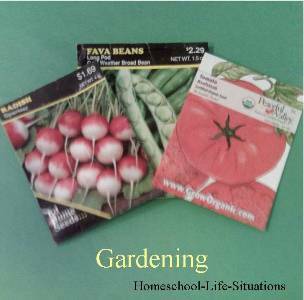 Homeschool gardening is a fun activity that can teach your children about God's creation. It is an activity that can get the whole family outside.